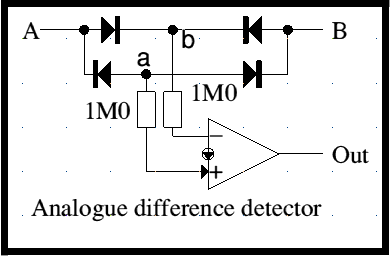 This is an example using a Norton op-amp: these work by using differential input current rather than the differential input voltage used by conventional op-amps. The circuit is essentially a non-polarised comparator. With no input voltage to A or B bias current through the 100k resistor causes the op-amp output to go low. With an inputs into A and B, point a is pulled down to a diode drop above the lower input voltage whilst point b rises to the higher, less a diode drop. If the two are equal (neglecting the diode drops) the op-amp inputs are balanced but if the voltages are unequal then point b will be higher than point a voltage and the op-amp will be unbalanced and its output will go high. The main problem is that the voltages need to be unequal by at least the diode drops. however the input voltages to points A and B cam be several hundreds of volts since these voltages are never presented to the op-amp itself.